Transport for London (TfL) is responsible for a 360 mile (580km) network of main roads and all of London's 4,600 traffic lights. This includes Red Routes and bus lanes on main roads. The operation and maintenance of motorways is the responsibility of the Highways Agency. All other roads are the responsibility of the London Boroughs, which includes local parking and bus lane enforcement. Buses operate along most main roads around East Croydon and trams also run along George Street and Addiscombe Road. Some of these roads are closed to all but TfL traffic and some are designated as Red Routes. Unless otherwise sign posted, most mains roads have a 30mph (48kph) limit and this is sometimes enforced by fixed speed cameras. Some of the local roads have have restricted access to vehicles, due to TfL traffic restrictions on main roads, and they are now effectively cul-de-sacs. Many local roads have 20mph (32kph) speed limits and traffic calming measures. The AA and RAC provide route planners to assist in planning road journeys. All parking on all roads in the area is either prohibited or controlled at all times. This is vigorously enforced by parking attendants and/or CCTV cameras. There are number of multi-storey and underground car parks in the area. Controlled parking, using a ticket from machine or a permit, is available on some local roads. All parking charges, duration of stay and limit of operations may vary from location to location. 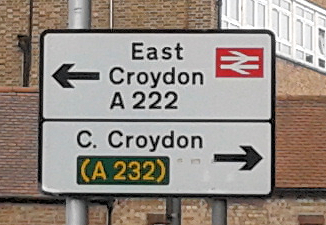 East Croydon is approximately 8.5 miles (14km) south of the Congestion Charging zone. M23 - To London Gatwick airport and Brighton. M25 - London orbital motorway with access to other motorways and major roads. TfL promotes a range of cycling initiatives, including details of cycle routes. Further details for cyclists can be found at London Cycle Network and Sustrans. The Santander Cycle Hire scheme, popularly known as 'Boris Bikes', currently only covers the Central London area. However, cycle docking stations can be found in close proximity to stations easily accessible from East Croydon.